V1655. 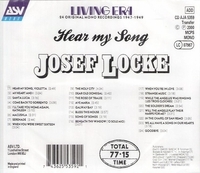 JOSEF LOCKE: Hear my song – 24 Original Recordings. (England) ASV AJA 5359, recorded 1947-49. Final copy!